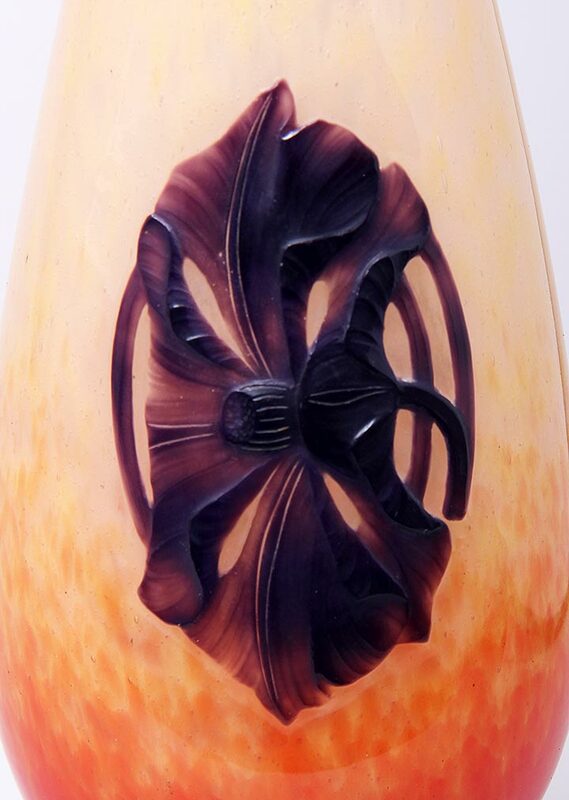 Schneider produced many colorful vases, but only a small percentage of them had Asian-inspired wheel-carved applications. It's an amazing example of padding and intricate wheel-carving done by the most skilled craftsmen. 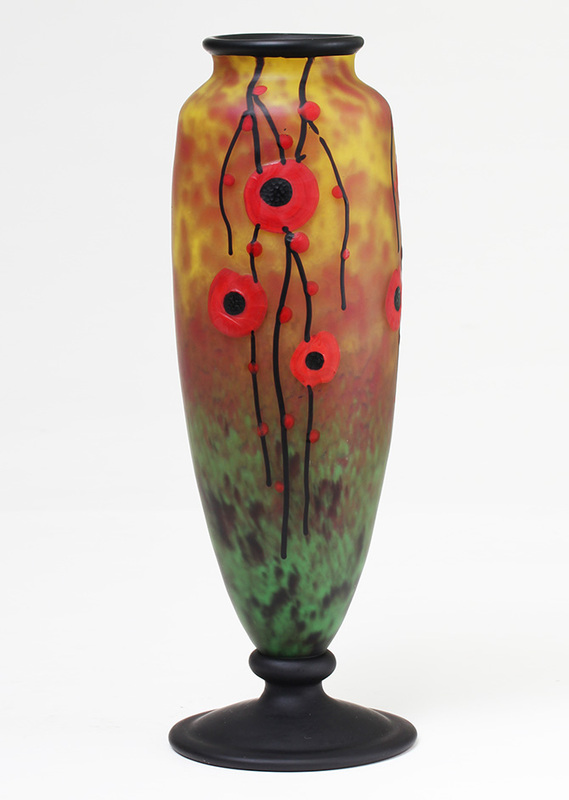 It's killer, with fabulous work, color, shape and size at 16" tall. 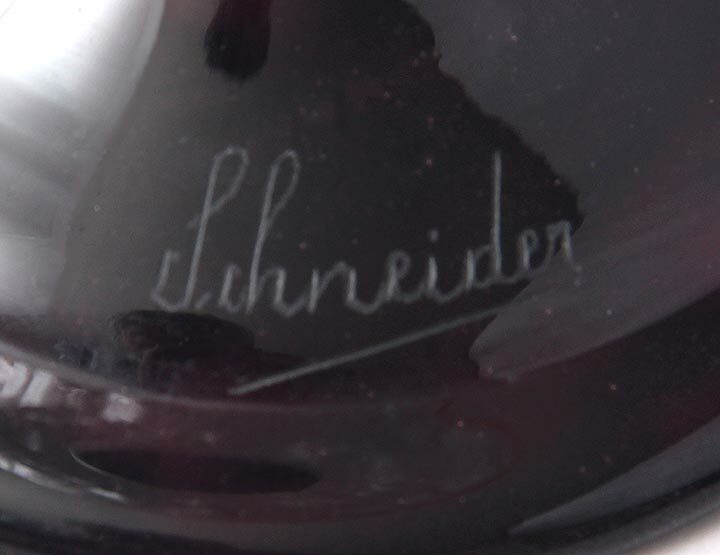 Engraved signature "Schneider" on the top of the foot. For the BEST collections. Mint condition. 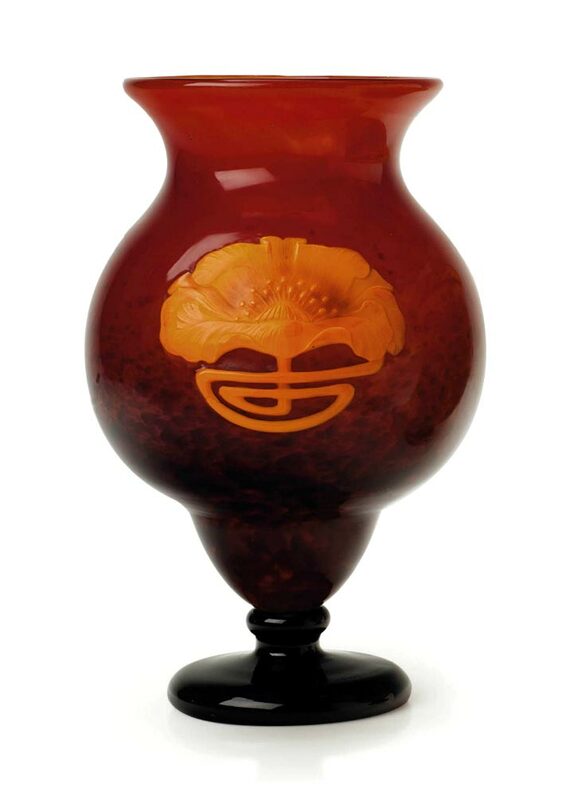 Not very many Schneider vases have applications and even fewer have carved applications. That's what's makes this special vase important. The deep black side applications have beautifully hand-carved Art Deco decoration. Additionally the top rim is molten applied. As is frequently the case, the internal mottling is lovely. Nice size at 7¼" tall. Signed. Mint condition. 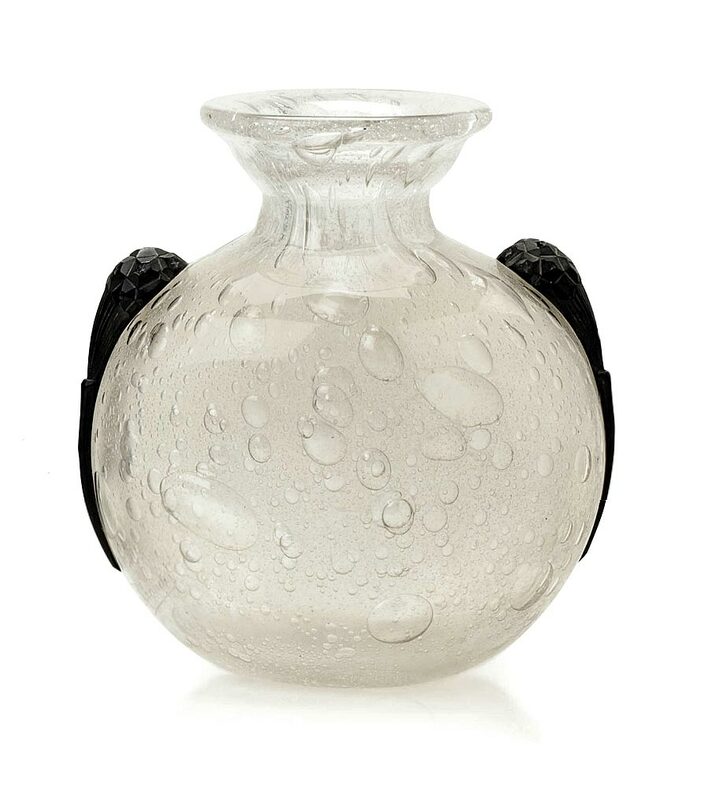 Schneider perfume bottles are rare. This one is a beauty, in green, with controlled bubbles. The original stopper is deep amethyst, almost black. Nice size at 8¾". Signed. The bottle is in mint condition, but the stopper has been broken and professionally repaired at the neck (and practically invisible). This $1,750 bottle is accordingly priced at $495. 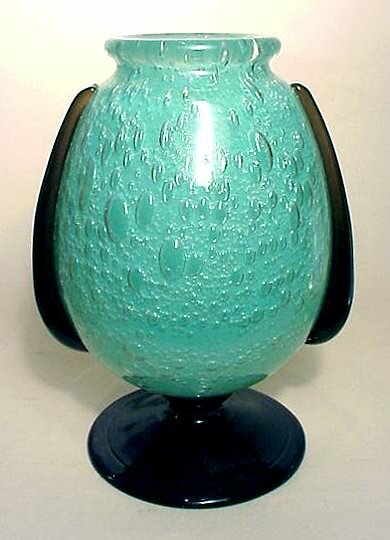 Charles Schneider created some of the most beautiful Art Deco French glass. 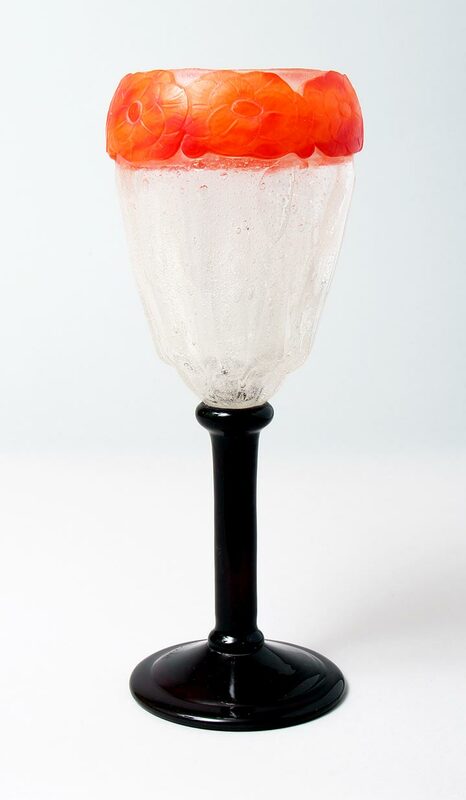 This important example uses a technique where the decoration was applied while the glass was molten. Needless to say, it was quite difficult and was only successful when executed by the finest craftsmen of the company. 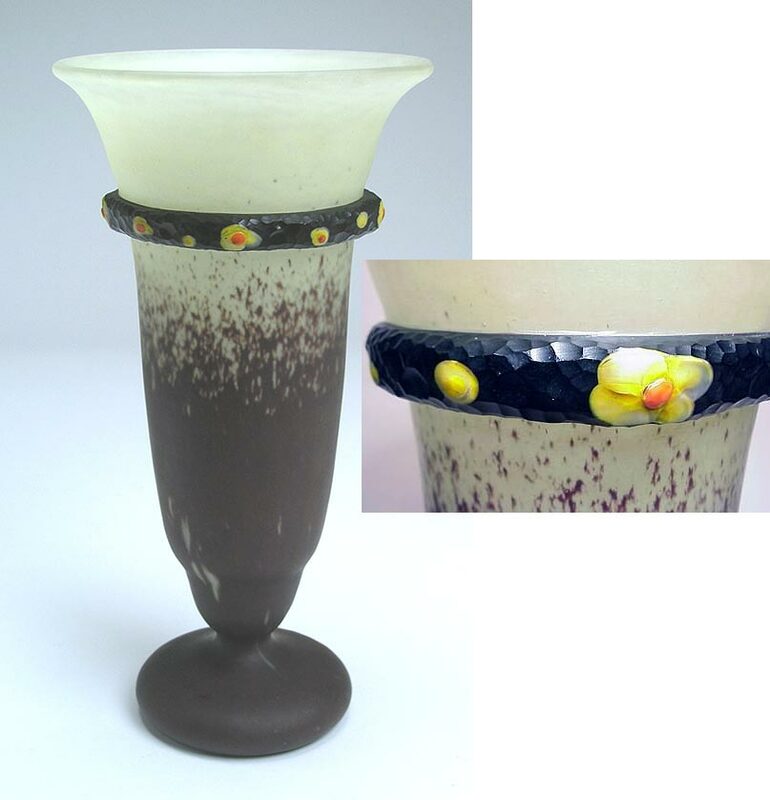 Each color had to be applied separately while the first worker held the molten vase at the end of a punty (a metal rod that attaches to the vase during its production) and another worker applied the decoration. You can imagine the difficulty and skill necessary. The single, raised flower appears against a heavily mottled and shaded orange to yellow background. 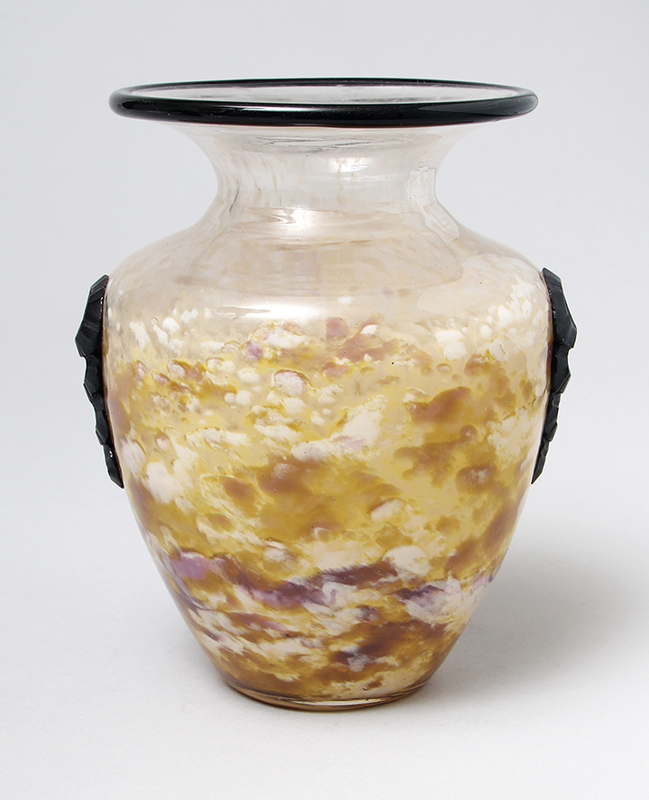 The vase was then applied to a deep purple foot, again while all the pieces were molten hot. 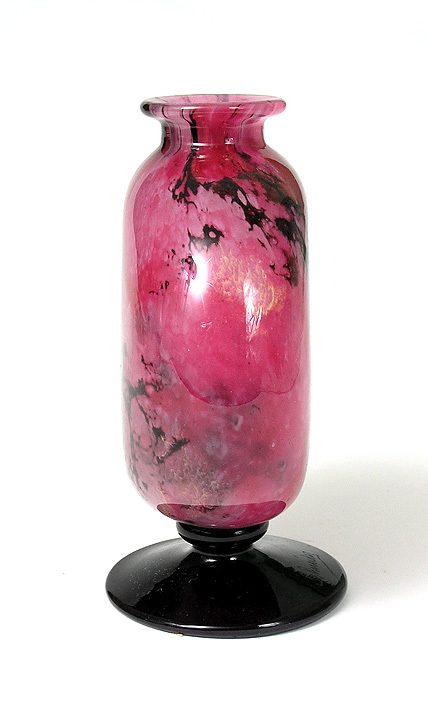 This rare, museum-quality, stupendous vase is now available for sale. It can grace your display cabinet. It's the perfect size at 9¼" tall. 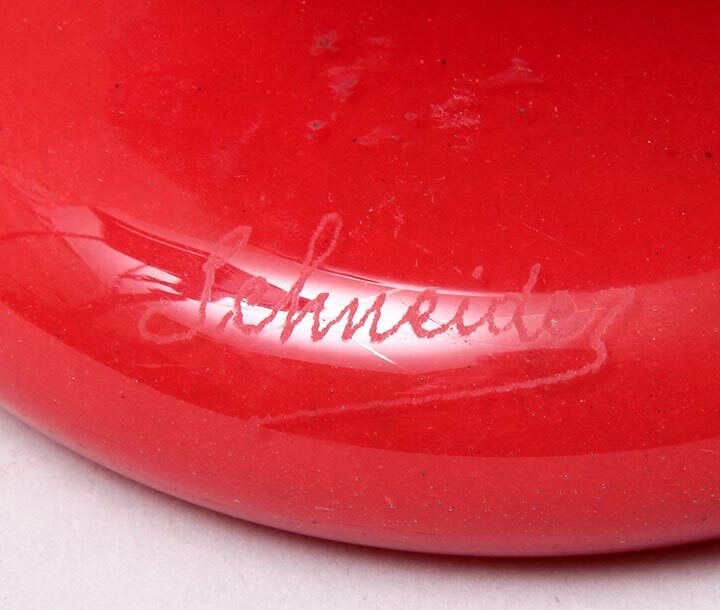 Engraved signature, Schneider, on the foot. Mint condition. 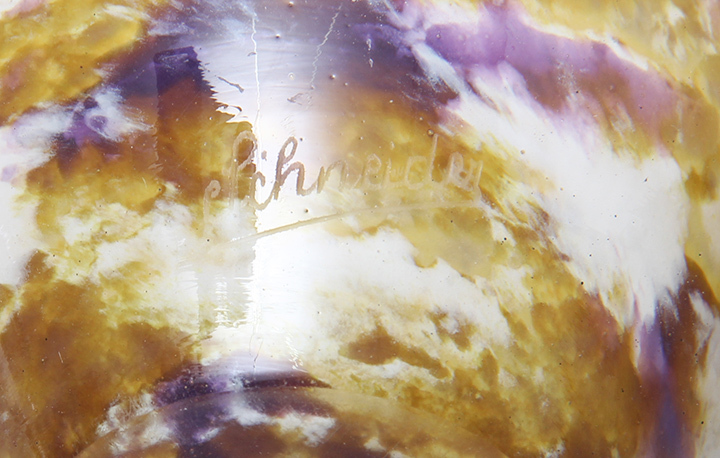 Schneider glass is often colorful and this beauty is no exception. 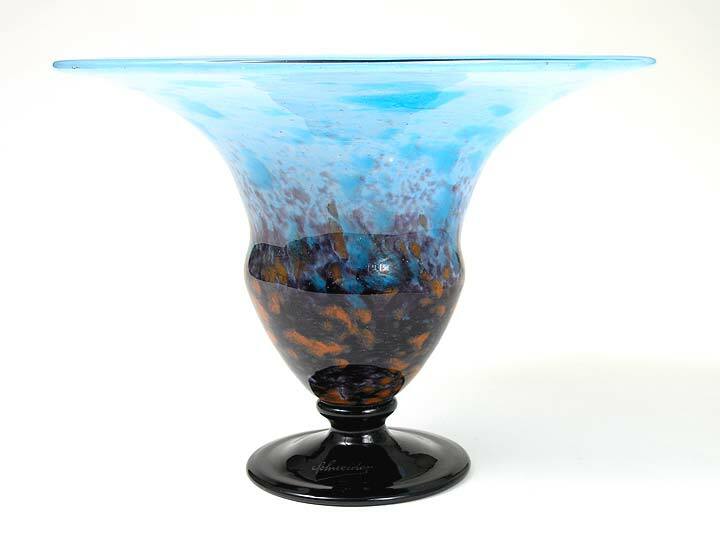 This is a large center bowl with blue glass, shading to purple glass with orange mottles, on a deep purple (almost black) foot. 8½" tall x 11½" diameter. Signed. Mint condition. Great price! 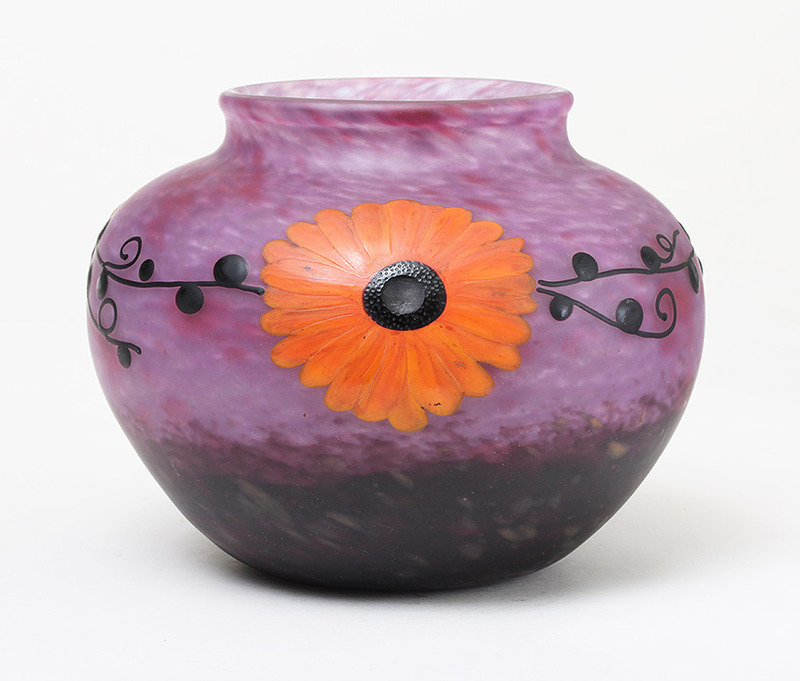 This is a great Schneider vase with hot applied orange coneflowers, as well as the flower centers, branches and buds. 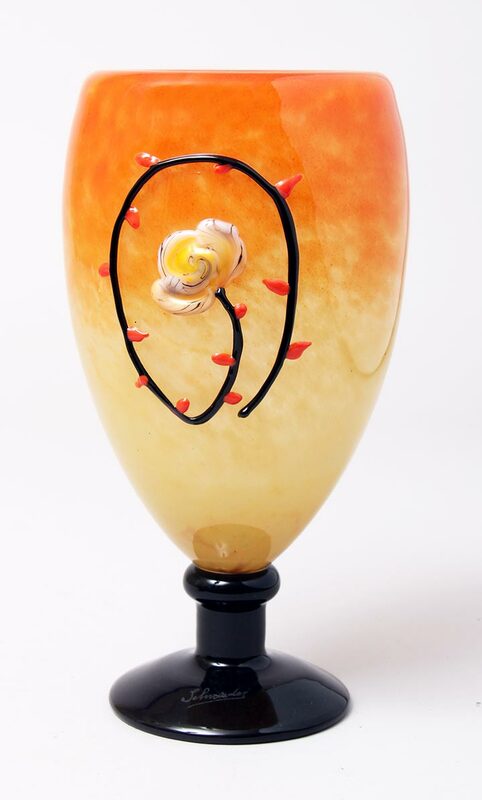 After the vase cooled, the carver used a wheel to carve all the detail into the flower petals and flower center. It was only done to the very best quality vases. The size is substantial, at 7" tall x 9" diameter. 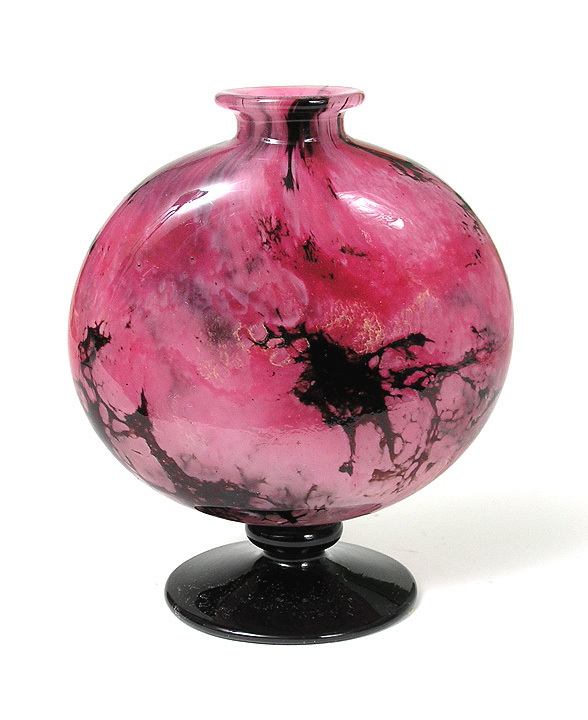 This is a top quality vase with the best techniques, color, and size. For the very best collections. Signed. Mint condition. 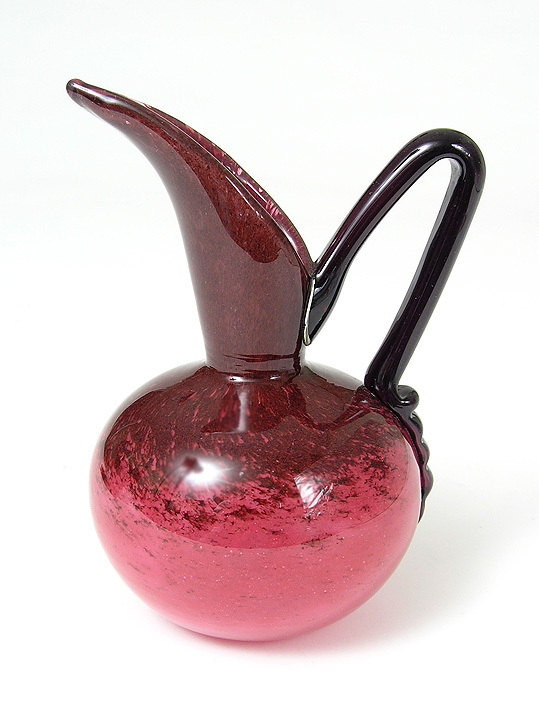 Colorful, diminutive ewer with rich color and mottling. Applied handle. 6¾. Signed. Mint condition. I don't have enough words to describe how great this vase is, but I'll give it the old college try. WOW! How's that? It's an amazing example of padding and intricate wheel-carving. 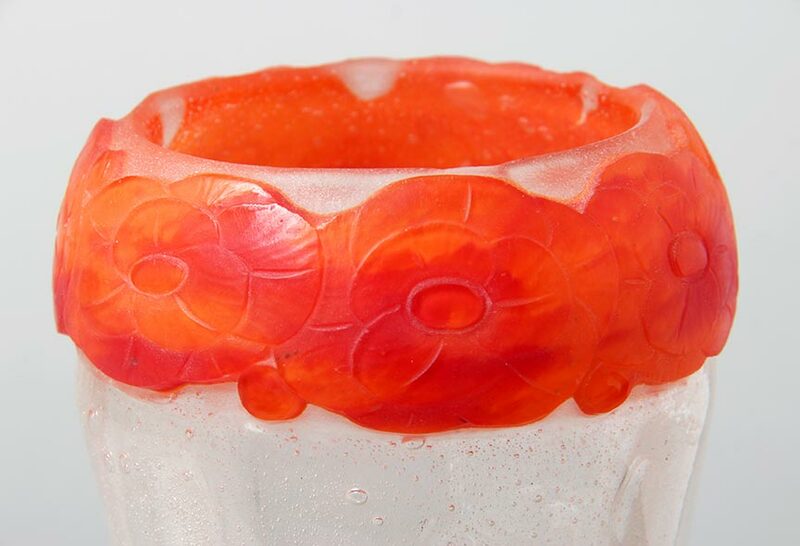 The bright orange flower incorporates elements of Art Deco and Japonisme. 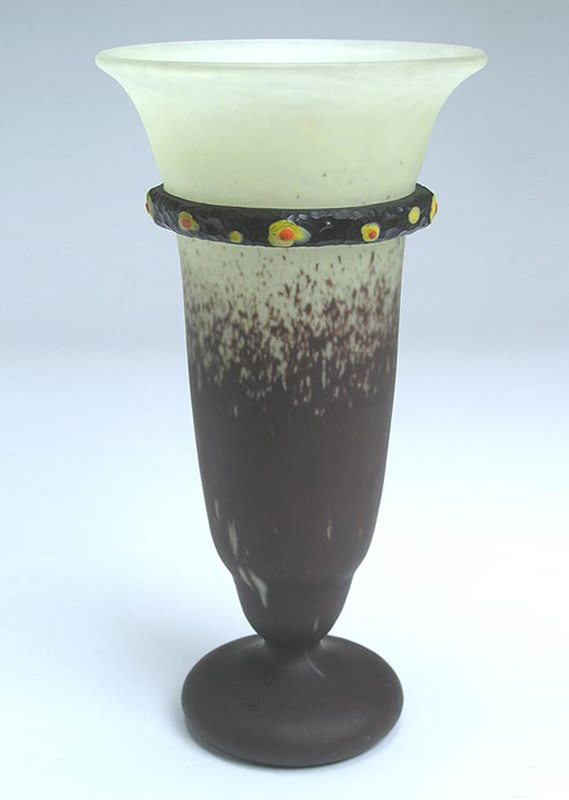 It's killer, with fabulous work, an elegant shape and a great big size at 11¾" tall. Signed. Mint condition. Schneider didn't make many mini vases. This one is a rarity because of the size and because of the sophisticated applied decoration. All in all, it's a rarity and a beauty. 3½". Signed. Mint condition. 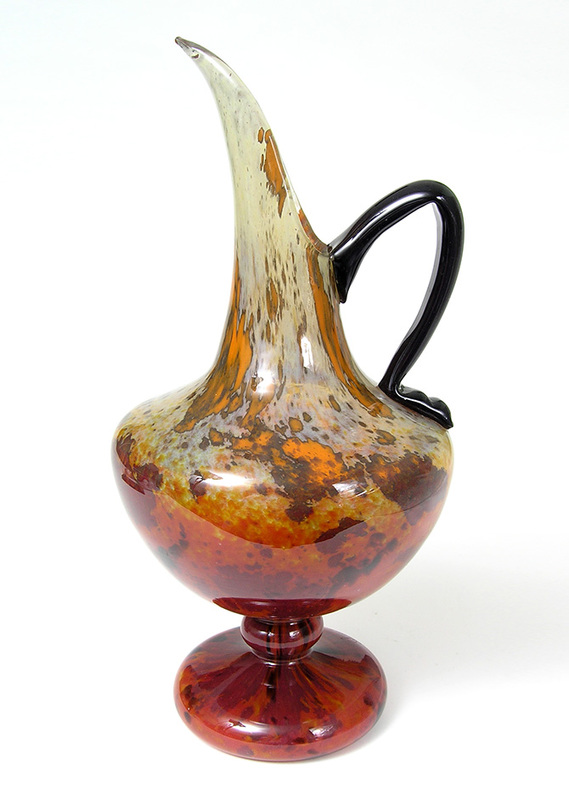 Beautiful, big, colorful pitcher with applied handle. 15¾". Very attractively priced. Signed. Mint condition. 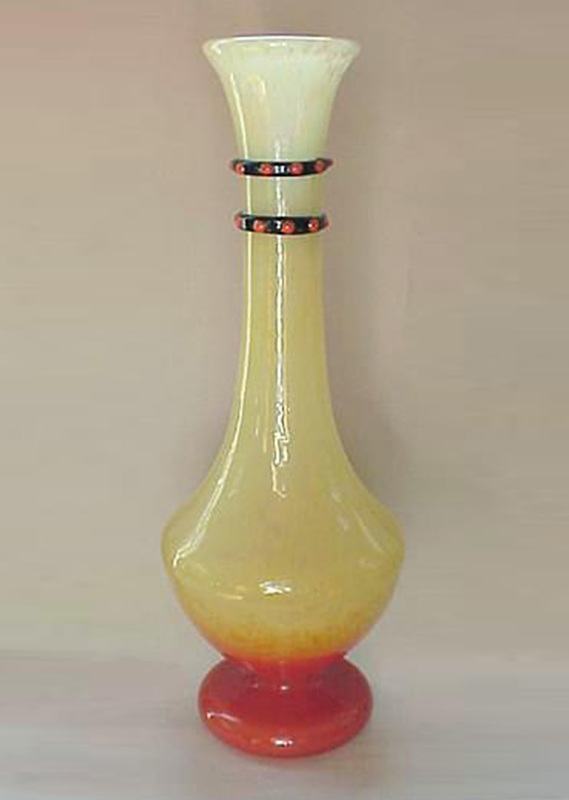 Schneider vases are usually colorful, but often not sophisticated. This example is as good as it gets. 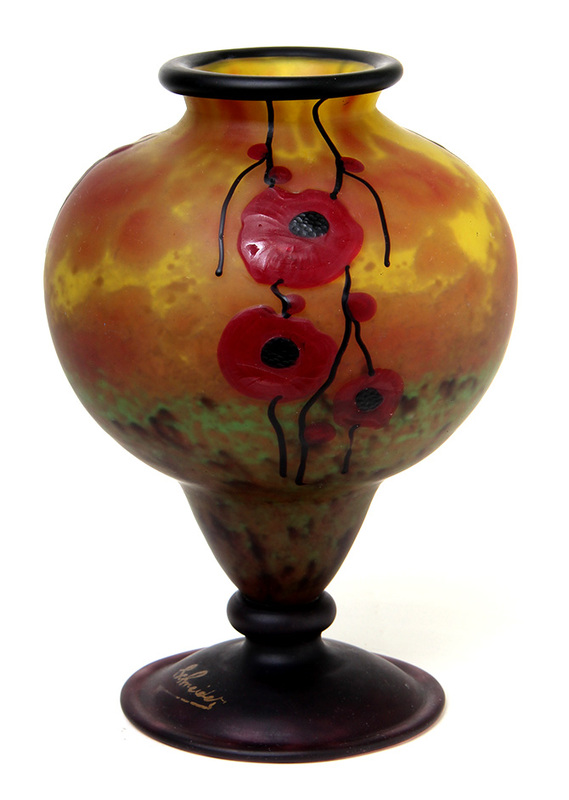 It has padded and applied poppies, buds and branches, an applied rim and applied foot, all with fabulous workmanship. The colors are vivid and breath-taking. It's for the very best collections! Substantial size at 12¼". Signed. Mint condition. 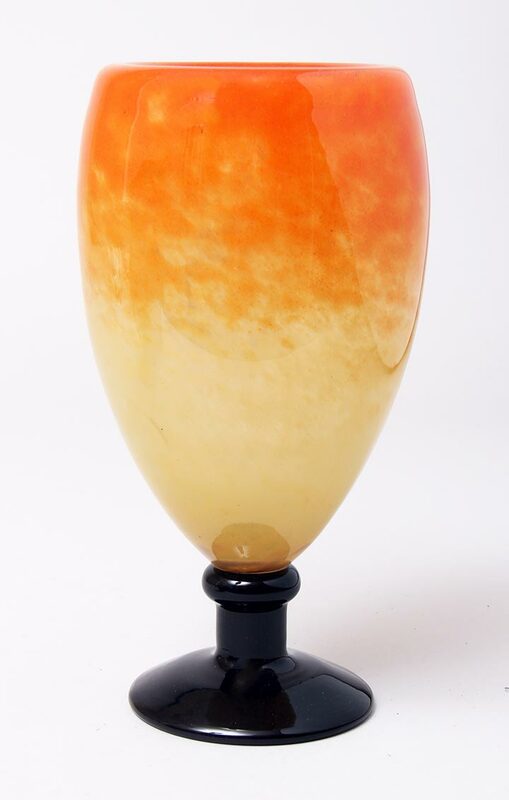 Schneider glass doesn't get much better than this vase. 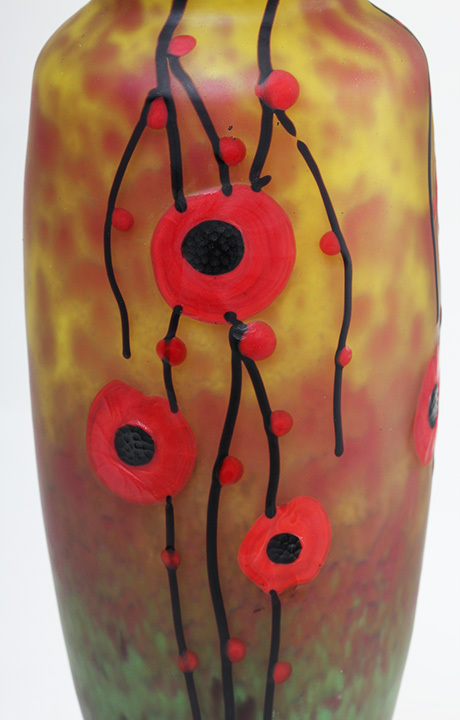 The intensely colored red poppies with black centers were applied when the glass was molten, as well as the branches and top rim. 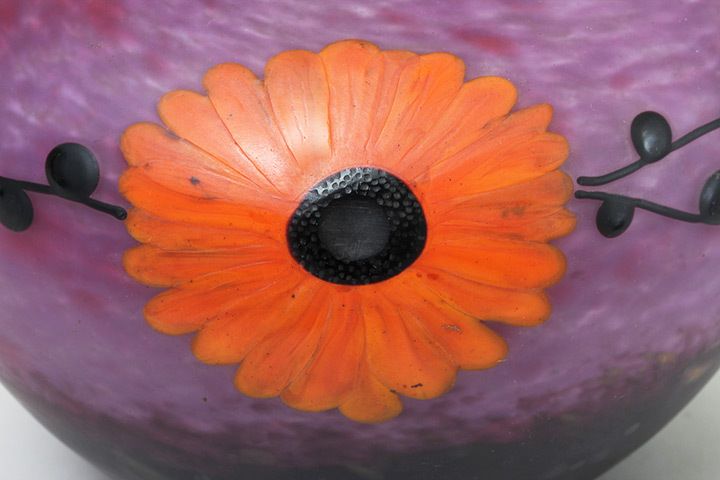 When the vase cooled, an artist hand-carved the details in the flowers. It's a killer vase, near the top of the Schneider food chain. It's for the best collections. 8¼" tall. Signed. Mint condition. 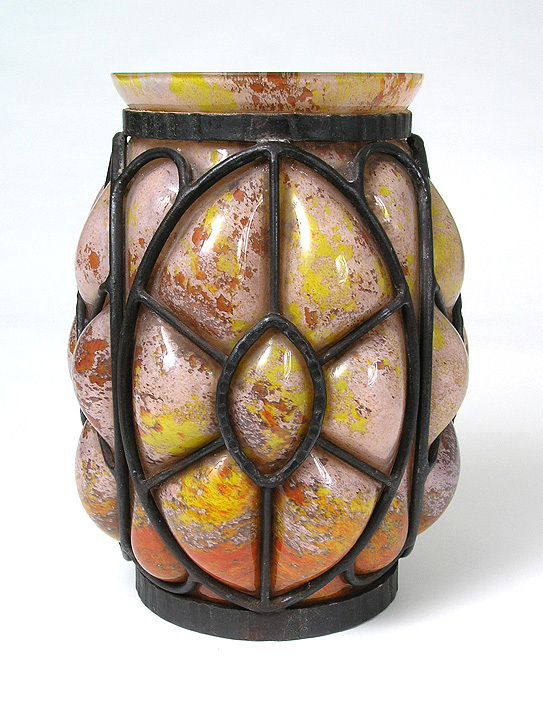 High Art Deco with beautifully colored and mottled glass blown into a wrought iron cage. Nice size at 10¼". 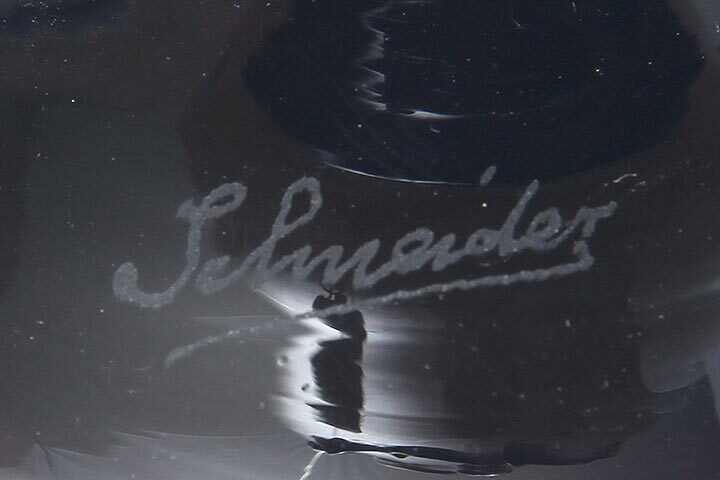 Signed "Schneider". Mint condition. 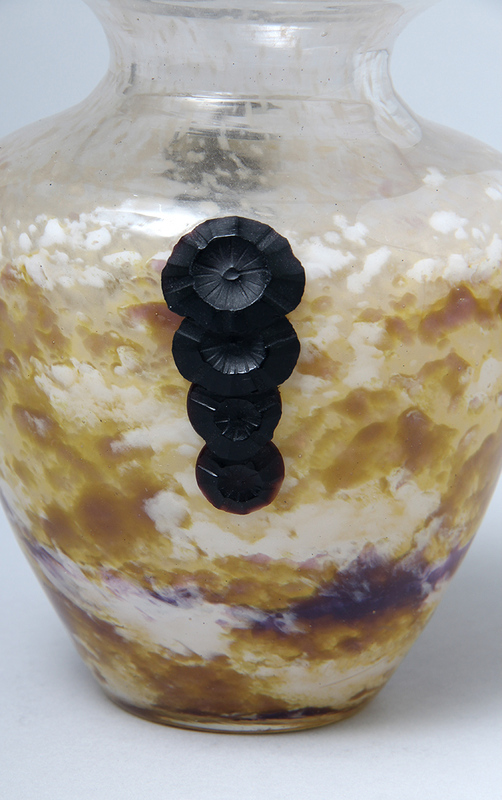 Excellent color with super internal decoration. Nice flattened form with applied foot. Signed. Mint condition. 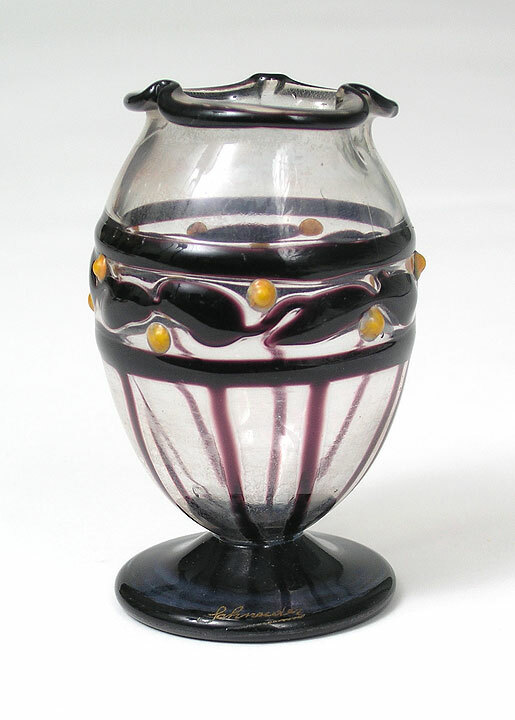 The applied black teardrops and applied black foot make this a wonderful example of Charles Schneider's controlled bubble vases. It's gorgeous and priced super right for immediate sale. Nice size at 10½" tall. Signed. Mint condition.